Six power cords deliver power to the server. Two types of AC power cords are available to support regional power source connections. Note - All six power cords must be connected to power the server. 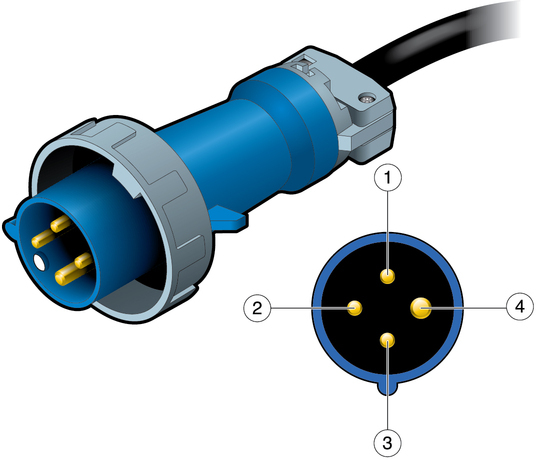 Note - When using the 5-wire power cord, the neutral wire is not connected. Only the three live wires and the ground wire are connected. Note - The power cords attach at the top of the server. Routing the power cords through the bottom of the server uses 115 in. (2.92m) of the cord length, leaving only 4 ft 10 in. (1.48m) available to connect to the AC power receptacles. Therefore, when routing power cords under the server, ensure that the power receptacles are within 4 ft. (1.22m) of the server. 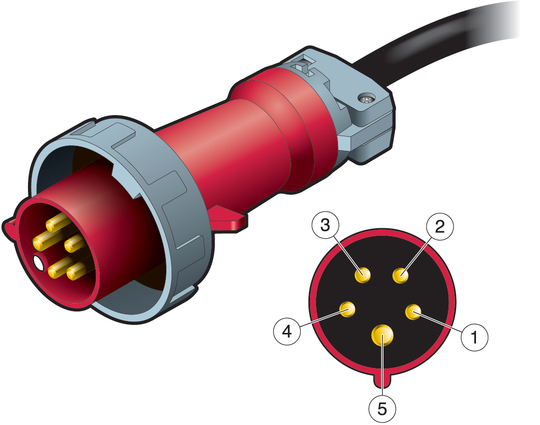 Caution - The installation site must have a local power disconnect (for example, circuit breakers) between the power source and the power cords. You will use this local disconnect to supply or remove AC power from the server. See Circuit Breaker Capacity Requirements for more information. Caution - Ensure that you install the server near your power grid's electrical outlets, and ensure that these outlets are easily accessible in case you must detach the power cords in an emergency. Note - Electrical work and installations must comply with applicable local, state, or national electrical codes. Your facility manager or a qualified electrician must connect these power cords to the facility power grids.